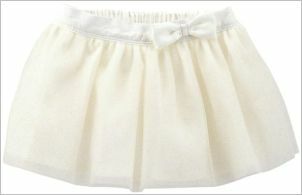 Does your little girl have a toddler skirt, or several? If she doesn’t, maybe it’s time to buy her a few! Skirts are fun additions to your little girl’s wardrobe: they are easy to mix-and-match with her blouses, leotards, or t-shirts and they add a little feminine touch that isn’t overwhelming. An ideal skirt will be no longer than knee length and fairly wide, to allow freedom of movement; though a longer or narrower skirt is fine for formal occasions. If you’ve got those four, you’ve got almost everything! One lovely toddler skirt, especially appropriate for little toddling people with round chunky legs, is the Carter’s Baby Girls’ Tutu Skirt. Though this is called “Baby Girls’, it comes in all the toddler sizes, and even up to 6x. A delicate looking tutu with a pretty satin waistband (wide and comfortable) and a beautifully formed satin rose at the waist. The outer skirt is soft tulle, the underskirt even softer material. This little tutu comes in six fairylike pastel color schemes: mint, pink, shimmer pink, shimmer white, shimmer ivory, and mint green. 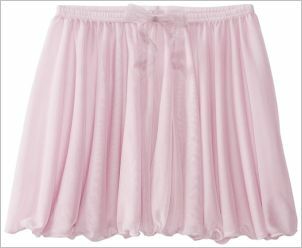 If you’d like a dance for your little girl to wear to ballet class--- or if she simply likes flying gracefully through life, without any dance classes—the Capezio Little Girls’ Children’s Collection Circular Pull-On Skirt is ideal. This is an 11-inch simple skirt with graceful lines and plenty of fabric to flair out when your little girl spins. The waistband is half an inch tunneled elastic, and there is a sweet organza bow at the front. This toddlerskirt comes in six colors: black, pink, lavender, light blue, and garnet. The waist tends to be small, so here also you may do well to buy a size up. Another pretty Capezio skirt is the Little Girls’ Pull-On Sequined Skirt. The waistband is a wider elastic, and the skirt is a partially sheer, very soft 100% polyester fabric that can be washed in the machine under cold settings. It has a faux wrap around front and pretty shimmery sequins: not so many as to make your little girl look gaudy, or as if she was walking around in a cheap costume, but enough for the fairy princess effect. This little skirt comes in pink and black; I find the pink particularly lovely. Again, buy a size up!